Numerous rehabilitation and remediation projects on former mine sites have been completed successfully internationally. These have involved collaborations between artists, architects, landscape designers, mining engineers, scientists and communities. The following are some examples of such projects, which are precedents for Mining / Art / Rehabilitation at NSW sites: AMD&Art, Pennsylvania, USA, C-Mine, Genk, Belgium, Emscher Park, Ruhr Valley, Germany. Australian-based creative projects associated with mining are commencing, but there is still much to do. Transdisciplinary participatory projects guided by local communities, with creative practitioners working together with scientists and engineers, can result in benefits including social and cultural re-vitalisation as shown by successful projects in the US, Belgium and Germany. This Mining/Art/Rehabilitation research has been supported by Inter-Faculty grants at UNSW, between Engineering (ACSMP/Mining Engineering), Built Environment (Architecture/Landscape Architecture) and the College of Fine Arts (COFA). Our precedent research published in Artlink, vol 33 no 4, ‘Rethinking Mine Remediation via transformative experimental art practice’ (Murray, Fowler-Smith, Keys-Statham and Taplin 2013) is a first step – towards rehabilitating and remediating former mining sites in NSW (e.g. at Broken Hill). This remediation will be facilitated through communities re-imagining the land with creative practitioners supported by engineering and scientific know-how. A range of Broken Hill stakeholders including local residents - Indigenous people, youth and others - local businesses, local government, and arts based organisations have expressed strong interest in participatory planning of the site based transformations. A potential Broken Hill derelict tailings dam site under consideration is part Crown Land and part land held by Robinson Community College. 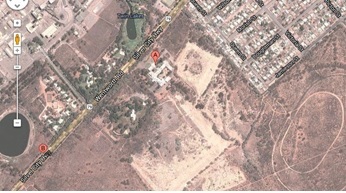 The potential tailings dam site at Broken Hill (Robinson College is marked at “A”).